You know I love my Kindle, so it's a delight to let you know that readers of the blog can now subscribe to these posts on Amazon's e-reader. A month's subscription is just $1.99, and includes a free two-week trial. 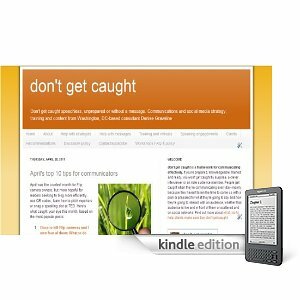 Go here to subscribe to the don't get caught blog on your Kindle. (Find all your options for subscribing to this blog on RSS, email and more here. You also can subscribe to our sister blog, The Eloquent Woman, for the Kindle here. Want to try this for your blog? I hope you'll use this new option, or one of the many ways to keep track of the blog. Thanks again for reading!